Continuing the occasional series in which I record significant events from my life. This installment takes up where the previous one ended. We had given up our membership of the co-ownership housing scheme and Freda moved back to her parents’ home in Herefordshire. It was the long summer break from school so there was no disruption to Ian’s education. A week or so after I arrived in South Africa the small team was joined by an electrical engineer. A week after that he suffered a heart attack and was hospitalised in Durban. In the circumstances his wife was flown over to join us. I had not previously met any of the team members. Walter, my fellow Mechanical Designer, although based in Coventry, had been engaged on another overseas project – this one in the Soviet Union. The team leader and the Electrical Engineer were both from the company’s Derby facility, where the former held a senior management post. As a consequence his role as our team leader was part-time and he returned to the UK after a few weeks, to pay the occasional flying visit every few months. Before he left, he was determined to demonstrate his driving prowess. Back in the UK Barry had built, and raced, a Formula Ford racing car. The team had been allocated 2 cars – necessary for travel from Umkomaas village to the mill and for personal transport at weekends. On his last weekend Barry decided we should have a group outing to Zululand, an area to the North of Durban characterised by spectacular mountain roads and beautiful scenery. The roads were, of course, unmettalled. Not surprisingly, I can’t recall precisely who travelled with whom. I’m certain that Peter, the electrical engineer and his wife, Vi, were passengers in Barry’s pale blue Peugeot 504. And, of course, Freda and Ian were with me in a dark green Datsun (Nissan) 260 C. I am less certain of Walter’s position – if he was in our car, why was he not driving? Walter was a widower. Whilst he was in the USSR his daughter was cared for by his mother but he was determined to have her with him in South Africa. About six weeks after Walter and I arrived in South Africa, Walter’s mother delivered the daughter to Freda in Hereford, from where she, Freda and Ian were picked up by a company driver and taken to Heathrow. Walter and I were permitted to fly from Durban to Johannesberg in order to meet them and accompany them on the final leg of their long journey. As for the weekend motoring tour of Zululand; I think Barry thought he was taking part in the African Safari Rally. I do recall Vi telling us that he scared her witless whilst pointing out various interesting features of the landscape with his eyes averted from sharp bends above sheer precipices ahead. As for me, I did my best to keep up as we raced along rutted dirt roads in the cloud of dust thrown up by Barry’s car. 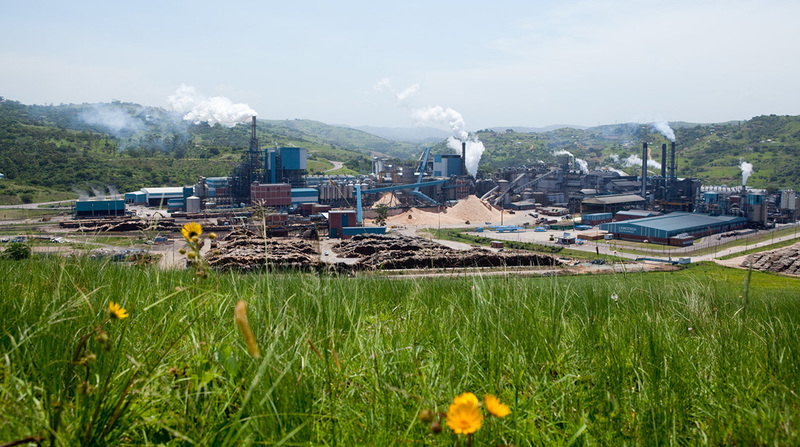 A recent image of the SAICCOR plant taken from their website. There are many more buildings there now than when I was there 45 years ago. The mill is located – yes, it is still operating all these years later, though now owned by SAPPI, the world’s largest producer of dissolving wood pulp as well as paper and board – a few miles upstream from the point at which the Umkomaas River enters the Indian Ocean. Originally a project created jointly by the South African government, an Italian fibre producer called Snia Viscosa, and Courtaulds, the plant was constructed by a team from Italy, many of whom had remained as the nucleus of the Engineering management and development team. The basic idea was to establish plantations of fast growing eucalyptus which would be coppiced to provide the feedstock for the mill. The resultant pulp would be exported to Italy and the UK to be converted into viscose fibre by the two specialist corporations. Whilst Courtaulds had succeeded in adapting their process – which originally used pulp from Scandinavian soft woods – Snia had not, and sold their share in the mill to Courtaulds. The project to modernise the raw material handling and storage for the mill had begun in the small in-house design office. Realising they lacked sufficient resources to handle such a large undertaking, they had turned to Courtaulds Engineering Limited to complete the job. The production of pulp from timber is a simple enough process. Apart from wood, the only ingredients are Sulphur and Limestone, which are used to create an acid in which the wood, having been reduced to small chips, is dissolved to separate the celulose from the resin that holds it together in its natural state. The mill in Umkomaas also generated its own steam and electricity. A new coal fired boiler was being installed by Babcock and Wilcox when we arrived. My first task was to complete the crane and conveyor system for transferring coal from the storage area to the boiler. Design for this had been partially completed, and construction of the reinforced concrete elements begun, already. I had to design the hoppers through which coal would be dropped onto a conveyor, evaluate tenders for their manufacture, and supervise the installation and commissioning. Walter was undertaking a similar exercise for the Limestone and Sulphur handling facilities. The Electrical Engineer took care of the selection and installation of electric motors and wiring for all three. These were comparatively simple tasks and were completed by Christmas. The real ‘meat’ of the project concerned the complete reorganisation of the timber handling facility which would occupy us for the whole of 1974. I’ll reveal more about this part of the project, my role, and our experience of living on the South African coast, in the next installment. By franklparker in Monday Memories on November 26, 2018 . Really interesting, Frank. What an amazing career; I’m wondering if you’re thinking of making a book from it – or maybe you already have. Thanks Mike! The idea is there in the back of my mind but I think it probably needs a bit more emotional content – and that’s hard. Many roads in Zululand were still untarred what I left in 1998 – the area south of Durban – the Hibiscus coast – is very pretty. Making me homesick again Frank! Hi Lucinda. Another episode coming tomorrow — guaranteed to make you homesick! I’ll be waiting for it Frank!